Pennsylvania residents currently enrolled in a government assistance program are qualified for free cellular phone service and a free handset. The Lifeline National Eligibility Verifier is a system that determines eligibility for a Lifeline phone service applicant. It is managed by the USAC (Universal Service Administrative Company). Beginning March 5, 2019, ALL Lifeline applicants in Pennsylvania MUST be qualified through the National Verifier before they can complete an application with a phone service provider. When you apply for Lifeline supported service, the National Verifier will be checked to be sure that you are qualified for Lifeline service. If not, you will be presented with a message informing you to go to the National Verifier and qualify then, return to complete your Lifeline Cell Phone Service application. Get started on a free plan right away! Use the on-line enrollment process to apply for your free service. 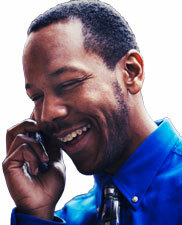 Upon approval you'll get your handset in just a few days, at no cost. The Lifeline subsidized plan in Pennsylvania will provide 1000 minutes of talk time each month for no charge. If that's not enough minutes, you can purchase more at great low rates with a pay-as-you go plan. With your anytime minutes, you'll be able to place local or long distance calls, access voicemail, and send and receive texts. In addition to your 1000 minutes of Voice, you'll enjoy UNLIMITED text messaging! You'll even get 50MB of data which can then be topped off as you need it. Every month, as long as you are still qualified and using your service, you get a fresh 1000 minutes! You won't get a bill for this plan because it's FREE!. There is no contract and no cancellation fee - you can cancel at any time. Minutes on the 1000 minute per month plan expire each month on your plan expiration date and do not roll over. To see if you qualify for this gov't subsidized program, check the list of qualifing programs here. You can also qualify based solely on your household income. If your income is equal to or less than 135% of the Poverty level as defined by the federal gov't, you can get a lifeline subsidy. Easy to Get Pennsylvania FREE Wireless Plan! All you need to do is verify your eligibility in the National Verifier then, complete our on-line application, including providing the necessary proof of identity (like a photo of your driver's license) and any needed documentation of income or assistance program participation. We'll get your phone out to	you right away! Wireless plans in PA include Nationwide calling, Caller ID, Call Waiting, Three-Way Calling, Call Forwarding, and Voicemail.